exercise – Page 3 – Living life the MegaSpecial way! Our new favourite class! Fight Klub! Photo taken just before I went off and poured half a litre of water over my head to cool down! MS you can try and stop me from doing things I enjoy, I’ll find a way around it, you will never beat me! 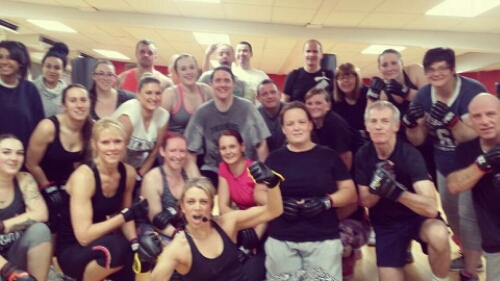 My friend, pilates instructor and now also our fight klub instructor Hannah Bailey at the front. Me and my partner at the back right, Deb in blue and me to the left of her! Paingry – when your in so much pain you feel angry! What to do when your Paingry – when your in so much pain you feel angry! I want to scream so loud my throat hurts, I want to cry so much that I run out of tears! Crying makes me angry, I try not to cry! I don’t like to feel angry! I’ve felt enough anger in my teenage years, I don’t want to feel like that again! I need to get this feeling out of me! It hurts so much to move though, every twist or turn of my body. Every step I take, one step out, leaning forward on that leg before I put my next leg down. The pain that shoots from my back, into my bottom and down my leg. Repeat that motion as I take one more step, the same pain on the other side now! It’s too much, I need my appointment! Please let me have my appointment date in the post tomorrow! It’s been 2 weeks, I need that appointment! I’m angry, this pain makes me angry! I’ve done nothing wrong to deserve this! I don’t want to be angry! I need to let it out! 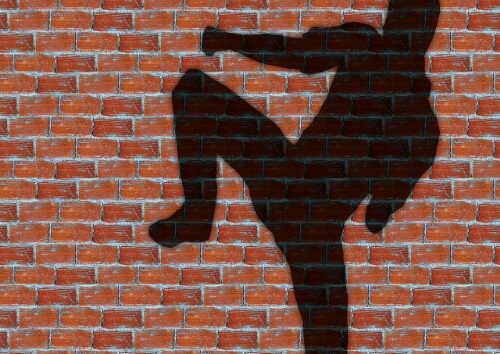 I need to go to Fight Klub! What’s that? You think I can’t do Fight Klub because I’m disabled! In this time I know not of this disease inside me that no one can see. I feel like I’m free! So this is what happens when I want to feel free! This is what I put my body through just to be me! I’m dedicated and I’m on it! I’m wondering how dedicated I actually am to pilates! I’m so tired, It’s so cold outside, I’m in so much pain and the cold is only going to make that worse! Gahhh! Ok, thought about it, weighed up the pros & cons! 11am Pilates, Hannah Bailey be ready for me girly! WITH AN ALMIGHTY PUSH, I’M GOING! Well 5 years since diagnosis & the pain has only gotten worse! I don’t think it’s gonna end yet! Dig in deep girly, we’re in this for the long haul! Thank gawd I am strong! This is hard! Good job I got the tough cookie genes!